I won’t be writing a long post this Thursday, because I have this exam today and I have realized it’s really hard to be thankful for something when you have an exam. At first I thought I would write a post thanking the sun, but he doesn’t have an exam today. Then I thought I would thank the birds outside, but they don’t have an exam today either. In the end I wanted to write a post thanking my exam, but even he doesn’t have an exam today. (Woow, this just took a turn.) So then I thought, there’s always someone who has it worse. Today, I want to thank Pluto (not the dog, the planet) for always having it worse and making me feel better because of it. Pluto has been through some sh*t in the past decade. He started out as a real planet. He was really something special. And then in 2006, out of nowhere, was told he wasn’t big enough to be a real planet anymore. From then on he would be a dwarf planet. But he didn’t let that bring him down. Pluto has proven to the earth, to Mars, to Jupiter, to Uranus, to Neptune and whatever other planets are out there, that size doesn’t matter. For that I believe Pluto deserves a round of applause. You go, Pluto! And it doesn’t matter what Neptune and Uranus are saying behind your back, you’re still a real planet to me. (I always root for the underdog.) Just let them talk. They’re just overcompensating for something else. 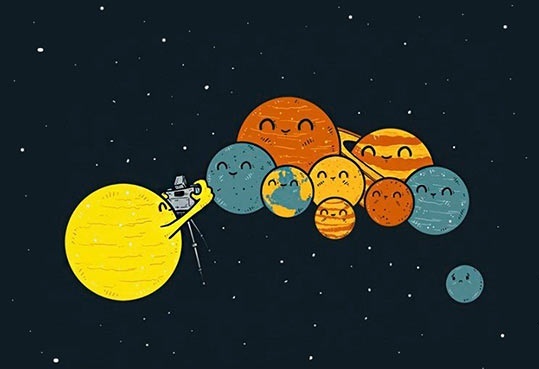 In the end you’re all orbiting around the same sun!